Today I had the opportunity to chat with a customer about dovetail saws, and he asked me the same question that I get all the time: what makes one saw better than another? Of course, since TFWW makes the Gramercy Dovetail saw, I have a pony in this race. We’re lucky to live in a time in which people have a lot of good choices. There are many great modern makers of dovetail and backsaws. I know a lot of thought went into the Gramercy Dovetail’s design, so I end up talking a bit about those features, and what they mean to woodworkers. We tout our saw’s high hang handle and its light weight, which makes it easier to saw straight. This isn’t a useful feature for anyone who has spent a lot of time with other designs and has learned to saw straight accordingly. The Gramercy Dovetail has the smallest handle on the market, but we think it helps with the sawing. It’s rare that anyone has an issue when using the normal three fingered grip - most people find it very comfortable, just different than what they expected. A review in the woodworking press noted the small size of the handle as if it were self-evidently bad, which I found very frustrating. The handle isn’t cramped or uncomfortable to use. It would be a shame if this design feature puts people off unnecessarily. By the way the picture at the top of the blog is my saw atop a pile of student practice dovetails left over from the class. Earlier this year I began teaching a class called Mastering Dovetails and it’s been fun to explore the concepts of sawing dovetails with the students. Most students use our Gramercy Tools Dovetail Saw but others bring in a variety of saws by other makers. It gives us a chance to play with different models and understand the design features of each better. I’m gratified when students gain the satisfaction of gaining a skill and find it fun to make dovetails well. The Gramercy saw is designed expressly to make woodworking more fun. Gramercy Dovetail Saw is not the most expensive dovetail saw you can buy, but at $240 it is still a chunk of change. We totally get that it’s an investment decision that almost no one makes lightly. 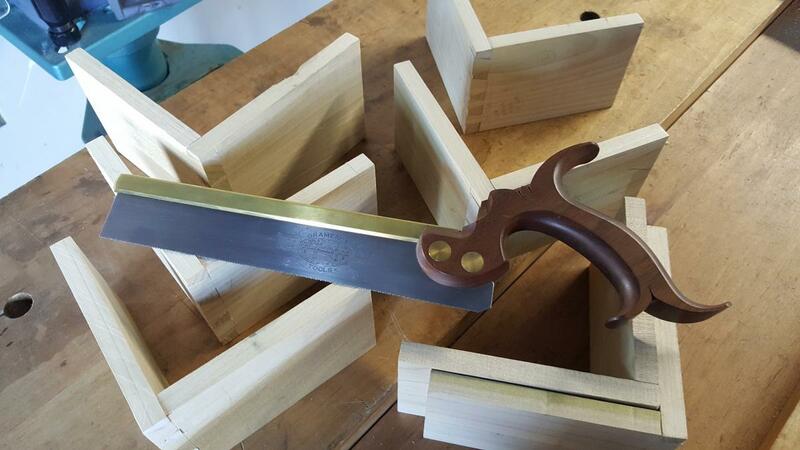 Remember if you purchase a dovetail saw from us, or in fact anything from us, you have a lengthy six months (and, if you live in the US, free return postage) to decide if the saw is right for you. And of course the best judge for this would be you yourself, not some pundit (like me). Some people profess not to care about how a tool looks, but I think most of us do. Our tastes may differ. I happen not to like the modern streamlined look. I love classical detailing. For other woodworkers, it’s the reverse. But either way, I think every time you look at your saw, you want to be able to smile and say to yourself, "Wow." The main reason I don't like modern saw design is that my thinking about woodworking is deeply influenced by history. Every time I cut a dovetail I am thinking of some 18th century apprentice. I love the brass and wood or period designs that keep me in the mood. I constantly am reminded by my tools that I am not as good as my equipment. Nice tools keep me striving. In the case of our Gramercy Dovetail Saw, the handles are made of black walnut - which I love. I know many makers like to use exotic woods: Duncan Phyfe had a small saw with a zebrawood handle. I get the appeal, although an exotic handle can really throw off the weight of the tool. There is an old saying among metal finishers, "Highly polished and deeply scratched." No matter who makes your saws, you want over the years to have honest battle scars, not simplifications because the maker didn't know how to fit a back, polish some brass, or make a handle without tearout. For me also - and the reason we have those nice decorative file lines on the handle is that it looks much better than a curve cut by a router - I don't want crude lines and corners, or a square handle with barely rounded over sides. We chamfer the brass on our brass backs and chamfer and round the nose. I like the finished look. I don't even like most historical backsaws post-1820 or so because the workmanship is just cruder than the earlier saws. I find the 18th century elegance that we copied inspiring. I’ve already written about our saw etch, and while saw etching uses a later technique (post-1860 or so), I love the what it brings to the tool. This is an actual important feature that shouldn't need mentioning, but everyone seems to report on it. Most modern saw-makers use foley saw filing machines to do their teeth. Foley machines are great but finicky and can't really reliably files saws finer than 15 tpi. In the era in which tools for handwork reached their peak - around 1800 - 1820 - dovetail saws were typically of much finer pitch (18 tpi and up) and pretty aggressive rake (zero). Starting a 15 tpi saw is a lot harder than a 18 tpi (or finer) saw, and I'm not a fan of the various schemes that are used to get around this problem, such as making the teeth less aggressive. sawing backwards, etc. I'm of the starting school of placing the toe of the saw on the wood, maybe tilted up a touch, and pushing forward, keeping as much weight off of the wood as possible so that the teeth do their job without jamming. Works like a charm with a fine tooth saw. THe only drawback to a finer pitch is that in thick material 1" or more the saw does cut slower as the gullets fill up. Can you control the saw - and saw straight or at any angle you so desire? We honestly think that the Gramercy Dovetail’s high hang handle and ultra light weight make it easier for a beginner to saw accurately. I’ve gotten to see a lot of beginners give our saw a try at shows and now in the dovetail class, and it’s easy to observe how quickly and easily beginners find the saw to control. A lighter saw influences the cut the least. Woodworking shouldn't about fighting your tools. 9" is about average. You can go shorter or longer. Some people like a longer saw. In my class one student used a Gramercy Sash Saw that he purchased because he wanted a more versatile saw. It's a light saw for its size. It took a little getting used to, but it worked out fine. Fast too. No lie: our saw has a break in period. This has gotten us into trouble with some reviews in the woodworking press. As far as I know, we are alone in echoing not just the general appearance of a traditional saw but also th4 way it is sharpened. This means aggressive filings and zero rake. When you first get your saw, it has seen only a few strokes when the shop tests it to make sure it tracks correctly and cuts fast. But those teeth are like needles. When you first use the saw, they will want to catch in the wood, especially in open pore species like oak. But after 10 minutes or so - the break-in period - any burrs and bits from the filing should be worn off have worn off and the teeth should be thoroughly evened out. At this point your saw will work smoothly and FAST. Will the handle stay true over time? We use Black Walnut because it is stable. I would guess that all of the mainstream materials used by everyone in the industry are fine, but if you do get a saw that is made from an exotic wood, make sure the maker says it will be stable. You won’t find much to admire in a gorgeous handle that is heavy and unstable. 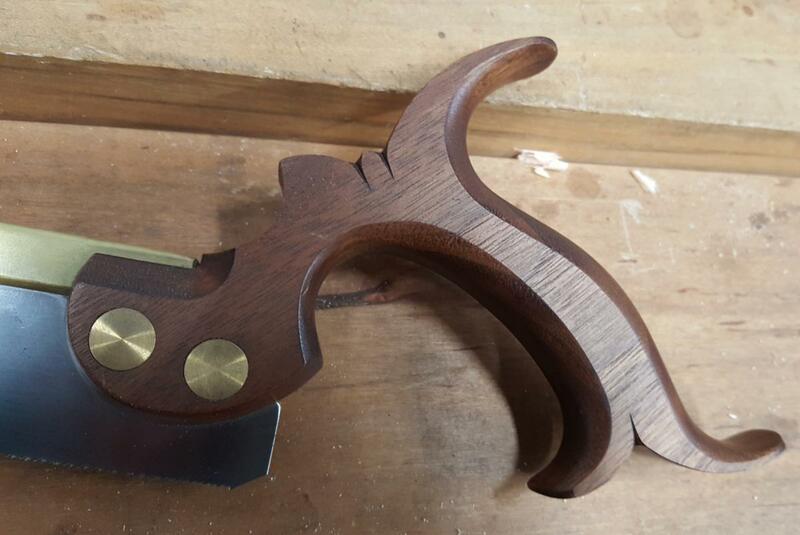 Nothing is more frustrating than a warping handle - especially on a premium saw. Think about golf. The amount of effort that goes into designing a handle and club that let's someone driver further is insane. And of course what a pro does is teach you to exploit the tool, not force the tool into your current posture. Sawing is exactly the same. The goal should not be that a saw handle feels perfect from day one. It might - hopefully it will, but it should not under any circumstances just mimic whatever you are used to, it should make you a better craftsperson. This is a tricky one. In theory, even the most expensive dovetail saw on the market is less than a trip to Disney World. And over time, per use, it's inexpensive. But a budget is a budget and all the dovetail saws worth buying are a healthy chunk of change - with two exceptions: The Veritas saw is well made, inexpensive (1/4 of the cost of ours), works very well, but way too modern for my tastes. I don't think it is as easy to use as our saw, but it's the best deal in well-made pistol grip saws. We also stock a straight-handled gent’s saw that I recommend to students all the time. It could use a sharpening out of the box but even so it works well, albeit slowly. As you might imagine, I think the Gramercy Tools Dovetail Saw does well according to these criteria. But I admit I'm biased. If I didn't like the way our saws performed we would be making them differently. The real good news is that with so many modern makers to choose from, all of whom make fine saws with differing characteristics, no matter which saw you pick, you will end up with something pretty excellent. I am a bit old school but it should be easy to make a saw that is excellent in function and finish at a much lower price point! If I were a budding entrepreneur I would head to Chime with specs and begin to manufacture a world class line of saws at half the price and still make a decent profit! Micheal Trangaris, You would have a saw that is cheaper for sure, and you would kill American jobs like a lot of the companies did already by moving production to Asia, non sense! Made in America by American for American is the real and only way to have a strong economy, not by increasing your profit on the back of other people!! I have that saw shown up there and lots of other American made saws, some vintage users and some new one, All of top quality. Keep up the great work you have done for years now!! I follow your blog a lot and I enjoyed it when you included the picture of your students dovetails. They did a good job better than my first ones. good to see them being inspired to continue. thank you for sharing this. Making/producing saws overseas may have a cheaper price tag but at what expense?, Getting decent customer service for repairs or replacement parts is an issue. Any warranty claims become "just a replacement item". Then, as the prior poster states, What happens to American Jobs...or American pride. I have tools made in Asia and Europe..but when there's a choice I'll choose the "Made in USA" item. You truly do get what you pay for! I do not have a Gramercy dovetail saw. I own a Lie Nielsen, one made by Bob Cosman, a Veritas and a Japanese saw recommended by David Barron. I find the saw recommended by David Barron very economical and superior in cutting speed and accuracy. My guess is that the best saw is the one you feel works best for you. The proof is in the finished dove tail. Just a quick note of thanks for making products in the USA. Environmental concerns, labor issues, political freedom, and intellectual property theft are some of the reasons I try to buy things NOT made in China. I wanted to enter a quick word about Bad Axe Saws. I have their tenon and their dovetail saws. Made in La Cross WI by Mark Harrell and his guys. Fabulous tools. Great guys. For better or for worse, when I got into woodworking with hand tools two years ago, I didn't know there were so many choices for handsaws. I picked one (actually only one I knew of at the time that was making new dovetail saws) that had a reputation as a quality tool maker. In this case I will say ignorance is bliss. I would have gone nuts if I had know there were so many options to choose from and so many things to consider. Actually, most of my tools were purchased before I was aware of so many choices. In some respects it's a bit of a relief. Gramercy does make really nice tools. I have their sash saw and don't regret the $260 I put down on it. My dovetail saws range in the extreme. One dates back to post civil war (I know! I couldn't believe it either. A saw lasting that long. I'm sure the blade had to have been replaced but it sure looks original) The other is a Lie Nielsen. I really wanted, and like the 10 inch blade... price wasn't bad either. My arms are just longer than most I like the extra throw without pulling the blade out of the cut.